Jack Ross, with his miraculous turnaround which took St Mirren from certain relegation to automatic promotion, is one of the most talked about Scottish managers of the last 18 months. He has received some of the highest plaudits in Scotland for his work and most recently pipped Brendan Rodgers, despite the Celtic boss’ double treble win, to the PFA Scotland Manager of the Year award. Ross has been noted for his expansive and attractive brand of football and encourages his players to have the belief that they can play football the way that they would want to. In fact, St Mirren and Ross drew credit from the highest echelons of football when none other than Barcelona credited them on social media for Cammy Smith’s incredible goal against Dunfermline. We ♥️ to see the Barça style away from Camp Nou! Ross has become the Sunderland manager and the English League One club’s fans should bear in mind that Ross, when interviewed by TheTwoPointOne stated; “if you move clubs or have a big turnover of playing squad you don’t necessarily try to implement the same system with players if it doesn’t suit”. This takes us onto what Ross has to do with this Sunderland squad. As of the start of June there will be just fifteen first team players available for selection and that includes individuals like Lamine Kone and Paddy McNair who are unlikely to want to play in League One and may be sold to help raise funds considering the magnitude of the rebuild required. They say that Rome was not built in a day but Sunderland will have to be built in only around 60 days as the season opener will be in early August. Both Sunderland and Jack Ross cannot afford a slow start; particularly in such an unforgiving league where clubs like MK Dons, Charlton and Portsmouth have struggled even with higher resources. PureFitbaw have picked out some players that we can see making the move from the SPFL to the Black Cats. Sunderland used 3 different goalkeepers ( Lee Camp, Jason Steele and Robin Ruiter) in the 2017/18 season and kept a clean sheet in only 6 out of 46 matches; an embarassing 7.6% of the time. Ross should make an aggressive move to secure the 30 year old, Heart of Midlothian keeper Jon McLaughlin. McLaughlin beat Craig Gordon, Joe Lewis and Wes Foderingham to be the 2017/18 SPFL Team of the Year player for his position and also won an international call-up for Scotland due to his impressive performances for the Edinburgh club. This move is a no brainer due to the fact that McLaughlin is a free agent, knows the league and is better than what Sunderland already have in the position. The player’s age is the only potential downside but is less of a concern when it comes to goalkeepers – for example 40-year-old Gigi Buffon is unlikely to be struggling for options this summer. Wes Foderingham – Rangers – Looks to be frozen out now that Allan McGregor has rejoined his boyhood heroes and again knows the league and is confident with the ball. Micheal McGovern – Norwich – Northern Ireland international offers solidity, is clearly number 2 at Norwich and may not want to be a backup. Sunderland have been particularly poor down both flanks and another SPFL bargain that could be targeted to help rebuild the team in the right way is the versatile and industrious 23 year old defender Jason Naismith. He is under contract until 2020, which in Scottish football is about as long-term as it gets outside of the Old Firm, but is owned by Ross County who have just been relegated so could be available. It may seem odd to recommend a defender from a team that has been relegated but Naismith, who usually plays at right back, was about the only bright spark for his club. Naismith is over 6 foot tall and would instantly help Sunderland in their defensive set up for corners and aerial duels particularly in comparison to the much shorter Adam Mathews who played most games at right back in the 2017/18 season for the Black Cats. The data below from Squawka highlights the frailties that Sunderland had in the air with 20 headed goals conceded last season. Naismith had the best record in terms of defending against dribbles in the SPFL Premiership 2017/18 season. His anticipation and positioning meant that, for this statistic, he performed better than even Celtic’s Kieran Tierney. Liam Smith – Hearts The 22 year old prospect might appeal to Ross as they spent time together at St Mirren and therefore the manager knows the player’s potential and current ability to some extent. Stephen O’Donnell – Kilmarnock The full-back has had an excellent season and was also pulled into the Scotland ranks for his performances domestically. He would be the most expensive of the three options and for that reason is recommended lower. Sunderland need to improve the central core of their team. Lee Cattermole has seen better days and could be specifically targeted by players at a lower level. His on field discipline issues and tendency to pick up cards is likely to see him replaced as the defensive shield in the middle of the park. In recent days Sunderland have been linked with a £3 million move for Dylan McGeough’s teammate John McGinn but the Black Cats could spend their money more wisely by investing in one of the most underrated players in Scottish football. Combative, intelligent and confident in possession; Dylan McGeough is almost a perfect fit to step in and offer new levels of energy and industry to the Sunderland engine room. McGeough does not just do the dirty work of breaking up play but has an impressive ability to play on the pivot of 180-degree movement in confined spaces which often allows his team to maintain possession and play out of trouble. He has a wide range of passing, highlighted in the Edinburgh derby clips below, and is good enough to also take on the basic elements of the “Regista” role and be the creative cog in the the transitional elements of the game which will be crucial if Ross looks to emulate his previous set up. 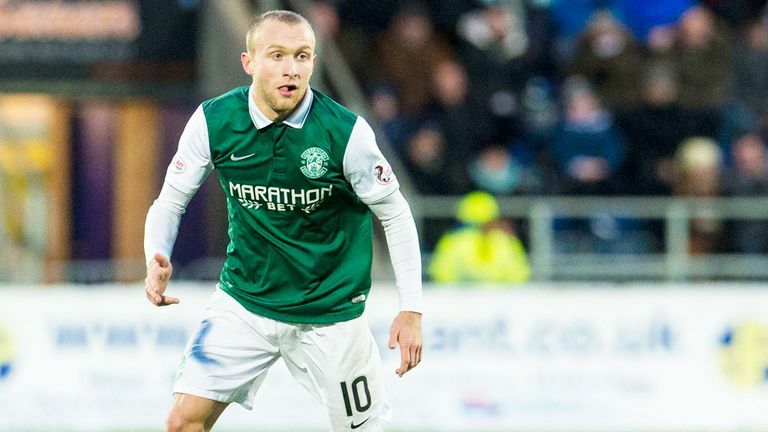 Similarly to the deal with McLaughlin Sunderland will have to act fast and aggressively as McGeouch, a new Scotland cap, already has a number of potential suitors ranging from Aberdeen to Blackburn Rovers and his current club Hibernian will also be doing everything they can to encourage the one time Celtic player to commit to them long-term. John McGinn – Hibernian, has been linked with Sunderland in recent days but while there is no doubt in his talent a price tag of up to £3 million does not seem like the best investment for a League One club, even one of the Black Cats’ size, and particularly at this stage in the rebuild. Allan Campbell – Motherwell, Offers a lot of similarities to Dylan McGeough in his style of play and is also younger so the positive of the development that could come from this Scotland Under 21 may be enough to tempt Jack Ross. Jordan Jones, an ex Middlesborough youth prospect, has been a revelation since moving to Kilmarnock and has really flourished under manager Steve Clarke’s guidance with the player even receiving a call up to the Northern Ireland international set-up. His performances in the SPFL Premiership this season led to Rangers bidding for the player in January 2018 although they baulked at the £1 million asking price that was placed on his head. The open negotiations that Rangers had for Jones clearly had an impact on him and there was a short period where it was evident he was understandably unsettled. Jones is a direct, dynamic player who ideally wants to cut inside and get a shot away but he is not one dimensional and is equally talented driving to the outside as he runs directly at defenders and almost squares them up to limit their positional outputs forcing them into giving him space on either side. The Kilmarnock player took home the left wing spot in the Scottish Premiership Team of the Year and with 10 assists and 4 goals for a team that was expected to fight off relegation you can’t help but be impressed with the contribution that helped push his team into the top 6 and has made Jones one of the hottest properties in the league. In comparison to wingers and wide attackers from clubs other than Rangers and Celtic in the SPFL Premiership Jordan Jones has a fairly average output in terms of goal scoring of 0.14 goals per 90 minutes or about one every seven matches. Analysis of the shots he is taking shows that this output is approximately what we should expect from his attempts – he has an Expected Goals rate or xG of 0.15 per 90 minutes – so we can assume his scoring will continue at a similar rate. On the other hand, he is setting up a goal about once every seven matches – 0.14 Assists per 90 minutes – but based on the amount and quality of the chances he is setting up (Expected Assists) he has an xA of 0.21 per 90 minutes or about one assist every five matches. Therefore we can expect to see an upturn in the number of assists he is getting. Jones takes a lot of shots – 1.96 Shots per 90 minutes – compared to other non Old Firm players in his position but they are from incredibly poor locations or situations – 0.08 xG per Shot (where 1.0 xG per Shot is a certain goal and 0.10 would mean a one in ten chance of being a goal). He is being wasteful and needs to work on setting up others or getting into a better position before shooting. He is setting up a decent amount of shots for other people – 1.24 Key Passes per 90 – and a reasonable amount, 36%, of those are chances in dangerous locations or Scoring Chance Key Passes (ScChKP). He also contributes a reasonable amount, 0.69 per 90 minutes, of Secondary Shot Assists (the passes before a key pass) and is involved in the overall build up to chances (xG Chain) to a high extent with 0.39 xG Chain per 90. Lewis Morgan – Celtic Jack Ross knows what the now Scotland cap has to offer due toe their time together at St Mirren. A loan deal could be tempting to the Glasgow giants as they would know that the player would continue to develop with a coach that got the best out of him. Ryan Christie – Celtic A player who is entering the final 12 months of his Celtic contract and has not really made the breakthrough that many had thought would come especially after his initial loan spell with Aberdeen,. Christie has himself admitted his future is up for debate and therefore could be an ideal addition to the North East. If Sunderland are able to add even 1 or 2 of the individuals outlined above to their squad and also give Jack Ross time to create a new culture and embed his ideas with the players then the favourites to win the league should justify their short odds of just 11/8.